In the Southern Hemisphere, there's no light show that can compare to Vivid Sydney. It brings tourists from all over the world to the coastal city, with millions crowding the harbour over the duration of the largest festival of lights in all of the Asia-Pacific region. Not only does it offer tourists a chance to enjoy art installations around the harbour and light projections on the sails of the iconic Sydney Opera House and surrounding buildings – not to mention the world-famous Harbour Bridge – it also gives photographers, both hobbyists and professionals alike, a chance to flex their trigger finger. Vivid Sydney is also no longer restricted to just the waterfront. There are other precincts that participate in the festival and are lit up to woo tourists. This year, when the festival returns to the Harbour City for the 11th time between May 24 and June 15, Taronga Zoo, Darling Harbour, Chatswood, Barangaroo and Luna Park will be dressed up in lights alongside Circular Quay. Photographing the lights and colours can be a challenge, though, especially given the large crowds that throng the precincts. If you want the best shots, you’ll need the right gear, ensure you use the appropriate settings for said gear, and find the best spots to capture the most interesting angles. You could be using top-of-the-line snappers and lenses and still take mediocre images if you're new to this kind of high-contrast night photography. So, if you’re keen on figuring out how to get the best shots, then follow these basic tips and you could capture the most interesting, colourful and fun images during the entire Vivid Sydney festival. The lights of Vivid Sydney are switched on only after dark. Taking images during this time of day means you’ll be using longer shutter speeds of about one second (or more, if you want to capture movement), and so will need to keep your camera steady. A tripod is therefore a must. However, if you physically press the shutter button on the top of your camera while it’s on the tripod, you'll often capture some vibrations from your own movement. Which means you’ll also need to use a cable release. This will allow you to trigger the camera remotely, stopping the camera from shaking when you press the shutter. Alternatively, if you don’t own a cable release, you’ll find that most cameras come with a self-timer mode, which can be set to take a shot either 2 seconds or 10 seconds after you’ve pressed the shutter button. Vivid Sydney is spread across multiple locations and, if you plan on covering a few of them in one night, you’ll end up needing different lenses for each scene. However, carrying multiple lenses in a bag can be both physically tiring and a logistical nightmare when you're moving through a crowd of thousands. So, we'd recommend getting yourself a universal zoom lens that will cover wide angles when you shoot from close up, like the light projections on Customs House and the Museum of Contemporary Arts, as well as allow you to zoom in when shooting from a distance. You can use any good quality 18-135mm or 28-300mm lens, or similar. When capturing scenes like those during Vivid Sydney, it’s important to shoot on manual mode as it gives you the most amount of control over your camera. You’ll need to change shutter speed and aperture size as you take images and move around to different spots, as well as changing the ISO value to suit each situation. The following three tips will help guide you through the manual settings that work best when photographing Vivid Sydney’s many lights. If you want to capture sharpness across the entire frame, you’ll need to use apertures of f/5.6 or above. The best aperture settings for Vivid Sydney are generally f/11 and f/12, which ensures you capture details throughout the entire frame. If you want to capture more light and want to focus on the foreground, you can use wider apertures of f/4 and lower, but you'll need to ensure the lens you’re using performs well when wide open. Some lenses simply don’t produce good images when shooting at the widest aperture. Some of Vivid Sydney’s light projects change quite rapidly. In these instances, setting your camera to shoot at long shutter speeds – like you would during most night photography scenarios – will instead result in motion blur. Keep in mind that this traditional kind of night capture does work for some scenes, but locations like the Sydney Opera House, in particular, can be a problem at shutter speeds of 2 seconds and higher. To freeze the lights and capture sharp images, start with shutter speeds of 1/30th or 1/15th of a second, then adjust if needed. If you’re keen on capturing the movement of the lights on the ferries when photographing the Opera House, you can then try slowing the shutter speed down to 8 or 10 seconds. If you’re looking to freeze the motion of the light projections so they don’t appear blurry, you'll need to do two things: use a fast shutter speed combined with a high ISO. We'd start at ISO 400 and see how that works, then move higher if needed. Keep in mind that the higher you go, the more noise (grain) you may get, depending on your camera’s noise performance. You should still be able to go up to 800, or even 1600 if necessary. If you’re using a long shutter speed to capture motion blur, be sure to lower your ISO down to 200 or 100. RAW files retain all the details of your photograph, so you can make changes like adjusting exposure, highlights and shadows during post processing without compromising image quality. If your camera allows you to shoot in RAW, opting for this mode gives you far more post-processing options. If you want photos you can use and share more quickly, many of the latest interchangeable lens cameras (ILCs) allow you to shoot in both RAW and JPEG at the same time. Vivid Sydney locations, especially the harbour, become very congested during the festival. Over 2 million people attend the show each year, and that means there are people everywhere. Finding the right spot, and the space to shoot without being jostled, can be hard. The lights are on each night from 6pm – 11pm local time, however, and if you want to capture the best images then we’d advise you to go early and stay late. If you’re able, also go mid-week when there are fewer people in attendance and you can avoid the crowded Friday, Saturday and Sunday evenings. Most of the light installations at Vivid change quite rapidly, and capturing the projections at just the right time can be key to a great image. You’ll need to know when to release the shutter and what kind of shutter speed you ought to use. This takes a bit of planning, and we’d recommend you visit the Vivid Sydney precincts a couple of times so you know what’s on offer. If you don’t have the time to do so, then be patient. The projections repeat after each set is complete, so stay put and watch the entire scene once or twice before getting click-happy. Many people shoot nonstop without checking their previous captures, and resultantly end up with mediocre images. Taking a few moments to plan your shots will also make you think about the composition – remember to allow room for secondary elements, like reflections or light rays, around the main subject. While you’re busy finding the right spot and avoiding the crowds – and, of course, making sure you’ve got your camera set up for the best possible shot – don’t forget to have some fun. Don’t just concentrate on photography, stop to watch the show and take it all in for yourself. If, however, photography is your main aim for attending Vivid Sydney, then try to be spontaneous. Capture some fun shots like bokehs, or capture the people around you as they stare in awe and enjoy the lights. You’ll end up with some truly original shots that no-one else will have. We’ve mentioned above that you should ideally visit the lights of Vivid Sydney at least a couple of times. While that helps with planning your shots, it will also help you find interesting vantage points to shoot the lights. The following list provides a few options that give you the best, and varied, views of the harbour, and this should help you to capture unique perspectives of the festival. While Circular Quay is the obvious choice, and the balcony of the Overseas Passenger Terminal gives you the best views of the Sydney Opera House and the buildings along the waterfront, you should walk around the harbour and try capturing the lights on the sails from different angles. Standing in front of the iconic building can give you a different perspective that you won’t get from the Overseas Passenger Terminal. If you’ve got a great wide-angle lens, you should get up onto the Cahill Expressway. The footpath beside the busy thoroughfare is accessible via a lift on the east end of Circular Quay, or via stairs on either end of the harbour. You get an elevated view of the entire harbour and a wide-angle lens will capture the Harbour Bridge and the Opera House in one single frame. Across the water from Circular Quay is the little suburb of Kirribilli. Anywhere along the water at Kirribilli offers amazing views of the Harbour City’s skyline. During Vivid Sydney, you’ll be able to capture the glass front of the Opera House, along with the rays of light hitting its sails. You’ll also be able to capture close-ups of the Harbour Bridge lights from here. Just to the west of Kirribilli is Blues Point. From here, you’ll get sweeping views of the Opera House from under the Harbour Bridge. It’s a great spot for wide-angle panoramas, or close-ups of the Bridge itself if you have a telezoom. This year, Luna Park will be lit up for Vivid and one interesting angle to capture its lights from is Lavender Bay – just a few minutes north of Blues Point while walking with the bay on your right. From here you get not just Luna Park, but you can capture the entire length of the Bridge with the amusement park nestled just under it. With the entire city skyline diagonally to your right from this vantage point, you’ll see the Harbour Bridge in all its splendour. This is another great spot for those sweeping panoramic wide-angles, capturing the city, the Bridge and the Opera House in a single frame. 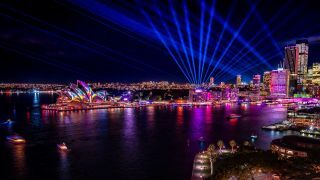 While this article aims at telling you how best to photograph Vivid Sydney, it would be remiss of us if we didn’t give you a few more tips we think you ought to know to make the best of the festival. 1. Dress warm. You’d think this was obvious, given the festival coincides with the start of winter in Sydney, but you’d be amazed at how many people come unprepared for the cold winds blowing in over the water. 2. Don’t drive. Parking in the city is a nightmare on any given day, and with millions thronging to see the lights during Vivid Sydney, spaces will be at a premium, literally. Moreover, there are often road closures to contend with as well. You're far better off using public transport and there are always more trains and buses during special events like Vivid Sydney. 3. Put your camera away for a bit. Don’t concentrate on just the images you’re trying to capture, as you’ll miss out on so much else. While the view through your camera’s viewfinder (or rear LCD display) can be great, it’s still like having blinders on. Look around you, walk around, enjoy the sights and sounds, the ambience and, most importantly, the light show. You might even see some things to shoot that you wouldn't otherwise have thought to capture. For more information on the festival and how best to plan your outing, head to the official Vivid Sydney 2019 website.